3 April 2017: Is the Monologue the best synth under $500... any synth under $500? 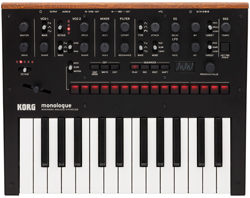 Home > Blog > 3 April 2017: Is the Monologue the best synth under $500... any synth under $500? 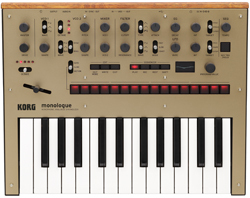 Audio Technology Magazine recently printed an extensive review of the KORG Monologue. It was a hit... to quote reviewer Christopher Holder: "in my opinion this is the best synth, of any kind, for under $500. It's a genuine hardware analogue synth that's not a homage (but equal) to the legendary synths of the past. As well as resuscitating classics, Korg is creating modern ones." your 'studio' in the e-waste bin. So this story is as much a celebration of hardware synthesis as it is a review of the Monologue. The Monologue sounds great. It's much like a monophonic version of the Minilogue but according to Korg's Chief Engineer of Analogue Synth Products, Tatsuya Takahashi, Korg's had a poke at the two-pole filter, the LFO and the Drive control giving the Monologue more bite and venom. It's a monosynth, so it's imperative the Monologue has kick-arse bass sounds and 'searing' leads, and it does. The envelope on the Monologue is as fast as you'll find anywhere - super responsive for those monophonic sounds. There are just so many sonic possibilities for a small synth. Sure, there are only two VCOs and there aren't endless modulation matrix possibilities but the sound- shaping options are generous. I think this will answer the first criticism levelled at most hardware monosynths: it'll be difficult to quickly tire of the Monologue. Other monosynths can soon feel stale after you've felt like you've explored the possibilities. Adding to the range of sonic options is the motion sequencer. Pioneered on Korg's analogue-modelled Electribe range, the motion sequencer allows you to punch/play-in some knob tweaking into a 16-step sequencer along with the different note values. Of course, the tempo of the motion sequencing can be clock sync'ed, which allows you to easily rope the Monologue into your DAW-based creation (similarly, the LFO can also be sync'ed). Unfortunately, the motion sequencer means there's apparently no room for an arpeggiator. For mine this is the biggest omission. In fact, if I had to choose, I'd prefer an arp to the (admittedly clever and powerful) motion sequencer. I'm not sure if this is fake news, but I saw on the internet that Richard James met his doppelganger. Not only did they look alike but they were dressed remarkably similarly. Yes, that's right, he found the Aphex Twin twin. Like I said, it's probably a hoax. Aphex Twin likes to encourage a range of intriguing myths, contributing to his legend. You may have heard that he owns a tank well, an armoured personnel carrier at least. Presumably to drive through the crowds when playing Glastonbury. This isn't true. He doesn't own a tank or at least I don't think he does. Aphex Twin consulted on the development of the Monologue. There are Aphex Twin 'AFX' presets. They sound awesome. One of the key Aphex Twin contributions, according to Korg, has been a microtonal feature. I'm pretty dubious about this. Personally, I'm wondering if Richard James is 'having a lend'. "My assistance on this Monologue project is predicated on you, Korg, adding the ability for me, the artist, to program in non-standard microtonal scales. I'm sorry but these are my terms." I rather think he's sitting in his bank vault house (true or hoax?) smirking "I can't believe they've added a feature no one will use 'cos I asked them to!" Saying that, if the ability to tune a monosynth to match your favourite Ravi Shankar solo is a non-negotiable tickbox, then you are most definitely in luck. I love the Monologue. I love all of Korg's analogue creations. When my kids leave home I'll celebrate by buying an Odyssey and MS20 maybe just to have in the living room so I can mess with them on the way to emptying the dishwasher, and let them be stunning art pieces when I'm not. I love the wooden rear panel. I love how it's 'Monologue' and not 'Monolog'. I love the five different skins it comes in. I love how battery operation is a viable option. But above all I love the very modern sound of the Monologue. Actually, above all I love that it's a genuine, living-breathing analogue synth for not much more dough than a softsynth. I can reach out and grab the Monologue. Play it, tweak it, work in sympathy with its quirks. 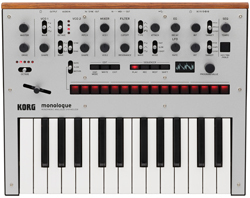 You'll grow close to the Monologue in a way that you'll never grow close to a softsynth. And when you take up fishing and look back on your studio days, you'll have something to show for it; something to pass on to the next generation. They may not recognise the USB or five-pin DIN sockets but they'll pop some batteries in, power it up, watch the nifty OLED screen tell them it's 'tuning up', hit bottom C on the Afx acid3 preset and be deeply impressed. This text originally appeared in Audio Technology issue 120.